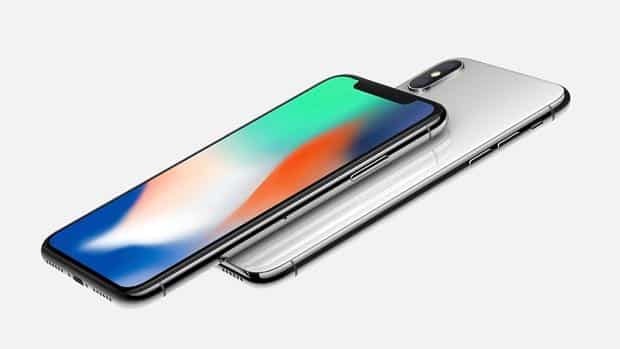 Apple just unveiled the iPhone X, its most mouth-watering iPhone in three years, and it comes complete with a gorgeous edge-to-edge screen, a way to unlock your phone with your face, and animated emojis that copy your expressions. Also included: a jaw-dropping price tag. Before we dive into details about the iPhone X (“X” as in “10,” by the way, not the letter “X”), you should know that it’s not the only iPhone that Apple announced at its Tuesday event. The iPhone 8 looks almost identical to last year’s iPhone 7. 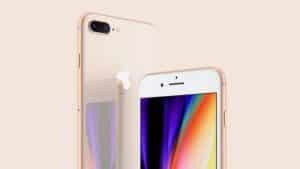 Along with the iPhone X comes the iPhone 8, as well as its jumbo-sized companion, the iPhone 8 Plus. Both the iPhone 8 and 8 Plus look almost identical to last year’s iPhone 7 models; inside are the usual updated processors and souped-up cameras. The iPhone X, meanwhile, is being touted as the “future” of iPhone, as opposed to the “present” of the iPhone 8. What about the iPhone 9, you ask? Looks like Apple skipped ahead to the iPhone X given that the original iPhone debuted 10 years ago. The big news about the iPhone X is its massive 5.8-inch display, which covers almost the entire face of the handset save for an ultra-thin bezel. The iPhone X’s 5.8-inch display covers practically the entire face of the phone. A thin notch at the top of the display makes room for the new “TrueDepth” camera (more on that in a moment), while the “Super Retina” display itself is sharper and more vivid than any previous iPhone display (or so says Apple). One of the beauties of the iPhone X’s nearly bezel-less design is that it manages to squeeze a larger screen into a smaller shell. 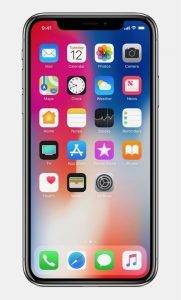 To get specific: at 5.65 by 2.79 by 0.3 inches, the iPhone X is somewhat smaller than the iPhone 8 Plus (which measures 6.24 by 3.07 by 0.3 inches), yet the iPhone X’s 5.8-inch display is actually bigger than the iPhone 8 Plus’s 5.5-inch screen. Meanwhile, the iPhone X and its 5.8-inch screen is only slightly bigger than the iPhone 8 with its (so tiny!) 4.7-inch display, with the iPhone 8’s shell measuring 5.45 by 2.65 by 0.29 inches. Not bad. Because of its edge-to-edge display, the iPhone X dispenses with a physical Home button. So, how do you get to the home screen, then? You’ll need to swipe up from the bottom of the screen. To switch apps, you’ll swipe up and then hold for a moment; no more double-tapping the Home button. To wake the screen, you’ll simply tap the display itself. No Home button means no more Touch ID, so Apple went ahead and developed a feature that’s long been a staple of Android phones: the ability to unlock your handset simply by looking at it. Apple’s new Face ID technology doesn’t just compare your face to a selfie. Instead, it uses an array of sensors in its fancy front-facing “TrueDepth” camera to create a contoured map of your face. The feature is so accurate, Apple claims, that it can’t be fooled by a photo or even a mask created by a Hollywood makeup artist. The iPhone X’s Face ID feature creates a contoured map of your face with help from the front-facing TrueDepth camera. 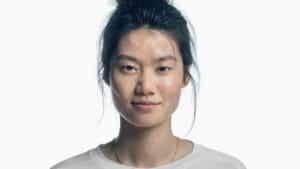 Face ID won’t unlock your iPhone unless you’re looking right at the screen, Apple says, and because it keeps track of your changing appearance, Face ID is (supposedly) smart enough to recognize you even if you change your hairstyle, put your glasses on, wear a hat or even grow a beard. Sounds great, but will Face ID actually work—and what happens if it doesn’t? The proof will be in the pudding, of course. But while Apple swears that Face ID can reliably recognize your face even in the dark, you can always fall back on tapping in a passcode. Besides unlocking your phone with your face and taking eye-popping selfies, the iPhone X’s “TrueDepth” camera has another clever feature: the ability to make custom animated emoji based on your expressions. 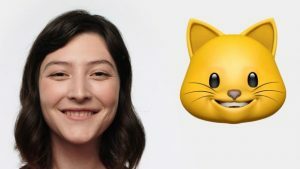 You can record your own animated emoji—or Animoji—using the iPhone X’s TrueDepth camera. All you have to do is pick from a dozen so-called “Animoji” from the iOS Messages app, then start making faces. The iPhone X’s TrueDepth camera will track your facial muscles and map your expressions onto the emoji you picked. Once you finish recording your Animoji clip (complete with audio), just tap Send to share your animated creation with your iMessage pals. Last year, Apple made a big thing about tossing the iPhone’s headphone jack and going with wireless Bluetooth earphones instead. (Yes, there’s an adapter for those of us who prefer wired headphones.) For the new iPhones, including both the iPhone X and iPhone 8, wireless charging is the latest craze. Both the iPhone X and iPhone 8 will support wireless charging. 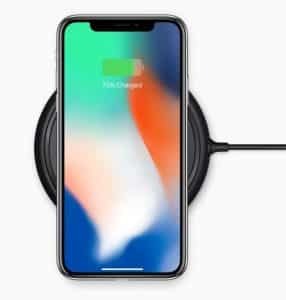 The way it works is simple: you just put your iPhone on a wireless charging pad (some look like hockey pucks, while others resemble mouse pads), and your iPhone will begin charging, no plugs required (well, aside from the plug the charging pad uses to get its juice). Apple says it plans to sell a wireless (and likely expensive) “AirPower” charging pad next year that’s capable of charging an iPhone, an Apple watch, and a pair of AirPods all at once. If you want a wireless charging station a little earlier—and cheaper—than the AirPower charger, you can snag one on Amazon right now for as little as $10. Any wireless charging pad that conforms to the Qi wireless charging standard should work, including wireless chargers made for Samsung’s Android phones. If you’re eager to get your hands on the iPhone X, you’ll have to bide your time for a few weeks. While the iPhone 8 will arrive in stores starting September 22, the iPhone X won’t begin shipping until November 3, with pre-orders beginning on October 27. Hold onto your hat, because the cheapest iPhone X—the 64GB model—sells for $999, while the 256GB version goes for $1,149. Yep, that’s a bundle. The good news is that Apple offers monthly payment plans as low as $50 a month for the iPhone X, and you can always trade in your old iPhone to offset a portion of the cost. Is a thousand bucks too rich for your blood? You can always snag an iPhone 8 for $699 and up. The iPhone 7 ($549 and up) and iPhone 6s ($449 and up) models are also still available, as is the cheapest iPhone, the $349 iPhone SE. Got questions about the iPhone X? Let me know, and I’ll do my best to answer!